Generally we use two remotes to operate TV at home, one for television and one for Set-Top Box so here in this Project I am targeting these two remotes and making an Android Phone working as IR Blaster so that TV can be controlled with the Phone, without touching any of the Remotes. You can either build the custom shield or can directly connect the components to the Arduino as shown in the ‘Circuit Diagram’ in below section. You first need to download and install the IR remote library from here https://github.com/z3t0/Arduino-IRremote. Unzip it, and place it in your Arduino ‘Libraries’ folder. Then rename the extracted folder to IRremote. Once you are done with the desired decoding part, note down all the decode values and other information with their corresponding button name pressed. This will serve as a database for the next phase of Arduino. The above program is taken from IRremote library’s ‘examples’ folder, you can check out more examples to learn more about using the IR remote. So that’s how we decoded the IR remote output. Now burn the Code, given in Code section at the end, onto this same board. Congratulations, you are done with the first half of this project. Log on to this link: ai2.appinventor.mit.edu, or try and search out MIT appinventor-2 on Google. Signing-in to AI2 requires a Google account, so if you don’t have, create one. Start a new project by clicking “Projects” tab at the top and select “Start New Project”. When you are done with the naming part and all, a blank screen will be displayed to you in which you can place buttons and text as shown above. This is the GUI screen, in which you decide how the app would look like to a user. On the left side of screen you’ll notice all those packages that you have selected in the GUI section. The image above shows what all components are there in a particular package that you can make use of. Also notice that Bluetooth module’s address needs to be provided in a textual format. When you feel that app is ready to be used and there are no errors as well, click on the “Build” tab as shown above and select the second option. This will download your own created app, onto the computer, in “.apk” format. Then just transfer this .apk file to any Android device and click on it to install. 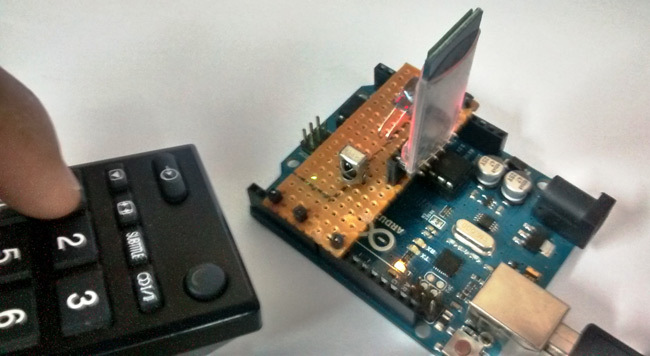 So this is how you can control any IR remote controlled device with your Smart phone, you just need to decode the remote of any appliances which you want to control with your Phone and replace the decoded HEX code of remote buttons in the Arduino code. A doubt, and there direct it the led to the TV receiver? to call etc? Hi, When I try attach the IR receiver, the "L" light goes blank. After trying to adjust the IR receiver, then the "L" light switches on and the IR signals get transmitted to the serial monitor. But there are multiple IR signals transmitted for single button.Please help. I used TSOP1738. Can u please provide the .aia file for the app. how should i connect it to the tv? Pl. share the app code too. Thanks for your Project idea, I succesfully done my project for Set top Box Remote (for TV Remote have some small issue). Androide App also coded and created for both Set-top-box and TV Remotes through MIT website. Now my Smart phone is being communicated with set-top-box without its Remote. But I'm facing some communication issue for TV remote. TV Remote Hex code was decoded and tested for code mismatch by pressing number of times, getting same hex code ok. I have some issue over TV Remote. eg., while pressing TV remote 'mute' button set-top-box 'mute' is responding even though hex code is different. can you please help reg. this issue. I'm bit new to Arduino. If the hex code of the set-up box and TV are different, then there is no way your TV would respond for your set-up box remote code.